First line: "When he grabs Mama's wrist and yanks her towards the wallhanging like that, it must hurt." 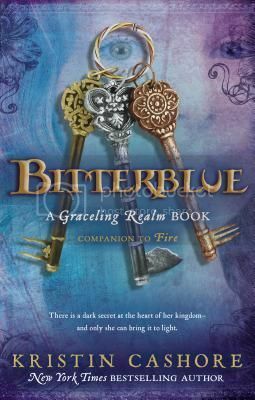 Queen Bitterblue rules a fractured kingdom after the defeat of her psychotic mind-controlling father Leck. This book really ties together Graceling and Fire which felt like they took place in two separate worlds, to a great extent. Bitterblue and most of her royal advisors kind of stumble through trying to rule the kingdom, as most of them are still pretty shellshocked from the years of abuse they suffered under Leck. Katsa and Po show up for a brief turn, as well as a much aged Fire towards the end of the book, but this is primarily, of course, Bitterblue's story. Bitterblue is thoughtful and sensitive, curious but cautious as she gradually teases out and unravels many of the mysteries that her father left behind. Her mother, who sacrificed herself in order to save her daughter from Leck, taught Bitterblue to use math to calm herself, and fight against her father's mind control. Clues slowly but surely begin to pile up, as Bitterblue sneaks out of the castle at night to mingle anonymously with her citizens. Everything from the three grand bridges and architecture of the castle that her father built, to the populace's lack of literacy, to the seemingly mad and random pranks mentally-addled survivors in the village play on each other and the symbols in her mother's embroidery begin to point to much needed answers for the still healing nation of Monsea. I don't think it's too much of a spoiler to say that one of the major reveals in the book is that one of the most heinous acts of Leck was his penchant for secret torture dungeons where he forced members of his court to do his dirty work for him. This was something that was hinted about, and easily guessed, but not directly discussed until very late in the book. There are plenty of other twists and turns though, that I never saw coming, which I really enjoyed. I loved the librarian Death's special ability - his Grace is to be able to memorize every book he's ever seen. This is a slower-paced, but still grand and sweeping epic conclusion to the trilogy. My coworkers in the children's department at my store love this book. I've never read Cashore before but her books sound really good. I loved this trilogy. The first two - I read them thinking, "How on Earth are these two random books related?" But the third book is really what ties is all together.